The research, reported July 30 in the Proceedings of the Royal Society of London B: Biological Sciences, found that female mice exposed to male pheromones gave birth to infants with greater mental ability. "This is the first study to show that pheromone exposure exerts an influence across generations in mammals," said Sachiko Koyama, an associate research scientist at the IU Bloomington Medical Sciences Program and visiting scientist at the IU College of Arts and Sciences' Department of Psychological and Brain Sciences, who led the study. "We found that male pheromones seem to influence the nutritional environment following birth, resulting in changes to the brain that could extend to future generations," she added. Pheromones are chemical signals used to communicate between organisms of the same species. 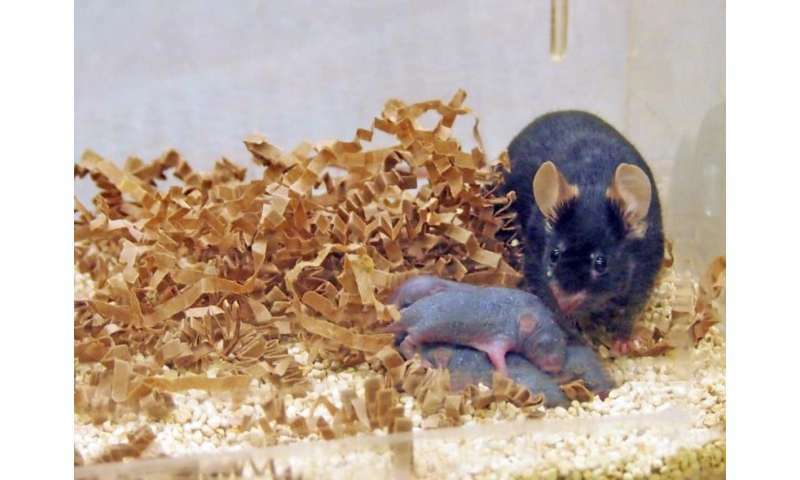 The connection between male pheromones and offspring's brain development seems to stem from the influence of male pheromones on the nursing ability of mother mice. Specifically, IU scientists measured greater mammary gland development in mice exposed to male pheromones a week after exposure, which may have led to greater volumes or improved quality of milk production. These mother mice also showed lengthier nursing periods compared to mice not exposed to the male pheromone. To measure the intelligence of the offspring, IU scientists placed mice in a water maze with a hidden platform. The mice born of mothers exposed to male pheromones learned the location of the hidden platform much faster, suggesting quicker learning and stronger spatial memory compared to the control group. These improvements in brain development and cognitive function may stem from specific "neuro-enhancing" chemicals in breast milk, such as sialic acid, a component of breast milk also found at high levels in the brain during early development. IU researchers found higher levels of polysialyltransferase—an enzyme that requires sialic acid to produce a molecule involved in neural cell development—in the brains of the offspring of female mice exposed to male pheromones compared to the control group. A synthetic version of the male mouse pheromone 2-sec-butyl-4,5-dihydrothiazole, or "SBT," was used in the study. The chemical was discovered at the Institute for Pheromone Research in the IU Department of Chemistry, directed by Milos Novotny, Distinguished Professor Emeritus of Chemistry and Lilly Chemistry Alumni Chair in the IU Bloomington College of Arts and Sciences. Novotny's lab pioneered research on pheromones in mammals during the 1980s at IU, identifying the chemical structures and determining the biological effects of these pheromones in mice, and later in several other mammalian species. Previously, scientists regarded pheromones as limited to the world of insects. "This publication represents an important addition to the field of animal communication and the effects of mammalian pheromones," said Novotny. "It shows that the effect of the male mouse pheromone SBT not only transmits an important olfactory message to the recipient females, but, through some as yet unknown molecular signaling mechanisms, brings apparent benefits to their offspring." Previous pheromone research has primarily focused on the influence of chemicals on animals within the same generational group, such as on mating behaviors, including the ability to suppress or encourage mammalian mating activity, as well as to attract females or stimulate aggression in males. The power of scents has also been shown in humans through research showing women who spend a long time together synchronize menstrual cycles. By focusing on pheromone effects across generations, Koyama said the new IU study contributes to the growing field of epigenetics, which studies the influence of the environment on genetics, such as when nutrition creates changes in the body which may be passed on to the next generation. "If we can find the specific milk 'ingredients' that affect cognitive function in the offspring, for example, we may eventually be able to use them as supplements to enhance brain development," she said. For their next steps, the IU team plans to conduct a more complete chemical analysis of the milk of the mother mice, as well as to track the mental development of their offspring across future generations.